Here is what the dress looks like on my daughter. 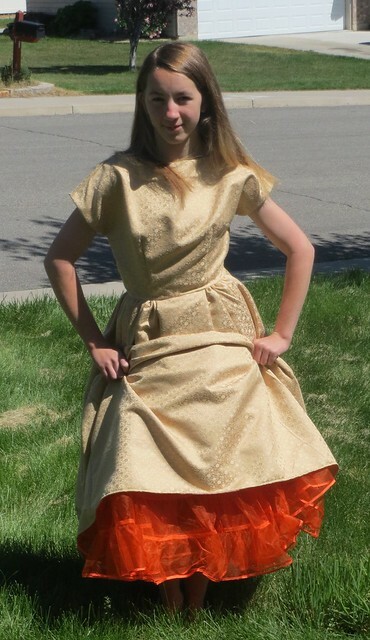 Of course it would look better with heels and hair fixed but this was just so people could see how it fit her and what the crinoline looked like being screaming orange. Wish I had not taken the first photo while she stood on the grass made her look much shorter with this length of dress. Thus the second photo on the side walk so you can see where it actually hits on her legs. Yes I should have ironed it before photo but I was in a hurry this the lack of hair shoes makeup, and ironing and all the like. So does it need some embellishments and if so what type of them do you think it needs. Other than a Letterman sweater, buster browns and bobby socks and a screaming high pony tail. I quite like it as it is! I couldn't believe it when I was buying some clothes the other day, they actually had fake letterman jackets for the little girls. And I live in Australia!